Living in Dundee I have visited The Unicorn several times. 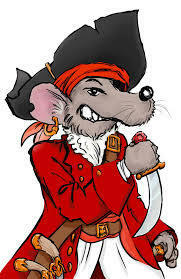 She is a fabulous ship and has been well taken care of. I heartily recommend a visit if you are ever in Dundee. The original essay has been partly re-written, with plans and restored photos. From a recent news article on www.frigateunicorn.org. The ship grounded in late February 2013 due to the dock gate jamming open on a falling tide. The tide fell a further foot after the ship had touched bottom. Thankfully, there was no damage or signs of strain in her almost-200 year old hull. HMS Unicorn is a Leda class frigate and is the second oldest Chatham-built ship still in existence after HMS Victory. Based on the design of the ex-French HMS Hebe, captured in 1782, the Leda Class frigates were ordered in six batches between 1800 and 1817. The first batch was comprised of just HMS Leda, while the second batch comprised eight ships ordered between 1802 and 1809 and included the famous HMS Shannon. 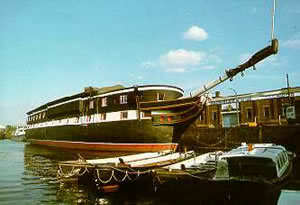 The third batch of eight ships was ordered in 1812 and were to be fir-built. Of the seven vessels which made up the fourth batch, ordered at the same time, two were ordered from the Honourable East India Company's Bombay shipyard and were teak-built. 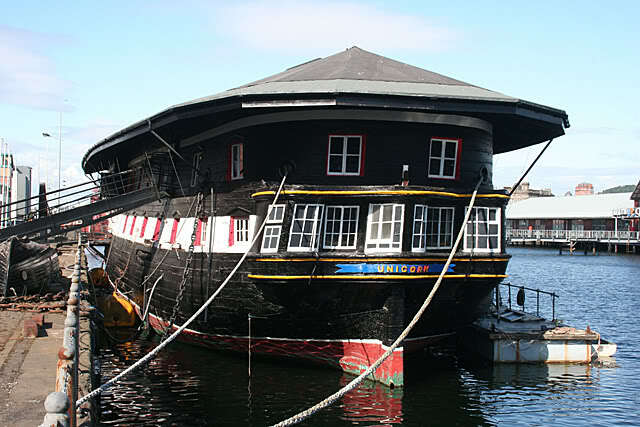 One of those vessels, HMS Trincomalee, has survived to the present day. The rest of the fourth batch were oak-built in the UK. A fifth batch, of six vessels was ordered in 1816, but they differed from previous ships in that they incorporated Sir Thomas Sepping's modified design for a round stern. The sixth and final batch was to have comprised 23 ships ordered to the same design as the fifth batch and was ordered in 1817, but the final six ships were cancelled. HMS Unicorn was ordered as part of this batch. Sir Thomas Seppings modified the design of the later Leda Class frigates with a round stern in order to make the ships more seaworthy and to make them less vulnerable to being raked by an enemy ship passing astern of them. With a round stern, the hull planking and internal framing is extended around the stern, rather than having the original traditional open, glazed stern. In addition to making the ship less vulnerable to being damaged or sunk by heavy seas striking the ship from astern, they made the hull stronger. 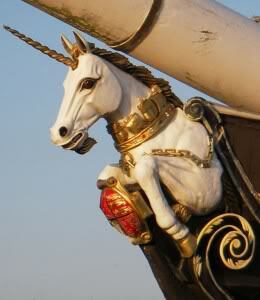 HMS Unicorn was ordered from the Royal Dockyard at Chatham on 23rd July 1817. She was laid down on No 4 slip (now the home of the Lifeboats exhibition) during February of 1822 and was launched from there into the River Medway on 30th March 1824. When the ship was built, she was intended to carry 28 18 pounder guns on her gundeck, 2 9 pounder guns and 14 32 pounder carronades on her quarterdeck with a further 2 9 pounder guns and 2 32 pounder carronades on her forecastle. The ship was converted to a hulk at Chatham immediately after launching and a large deckhouse was built over her upper decks. The ship remained a hulk for the whole of her career in the Royal Navy and was never rigged or fitted for sea. In 1857, she was loaned to the War Department for use as a powder hulk and was towed to Woolwich, where she remained until 1862, when she was returned to the Ordinary at Sheerness. In 1873, the ship was refitted for use as a Royal Naval Reserve Drill Ship and was towed to Dundee, where she remains to this day. 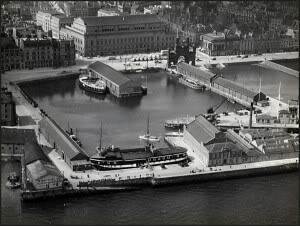 HMS Unicorn in the Earl Grey Dock at Dundee in 1935. During both world wars, the ship served as HQ, Senior Naval Officer Dundee. In the early 1960s, the ship was moved from Earl Grey Dock to Victoria Dock, to make way for the construction of the Tay Road Bridge. In the late 1960s, the ships continued survival was threatened when the Royal Navy decided to move the Tay Division RNR ashore to a new purpose-built base to be called HMS Camperdown. The HMS Unicorn Preservation Trust was formed under the Chairmanship of Lord Dalhousie with HM The Queen Mother as patron. The ship was formally handed by the Ministry of Defence to the Trust by Prince Phillip in 1968, in whose care she remains today. In her entire career, HMS Unicorn has never needed to be restored, merely preserved and this remains the situation today. Plans were made to rig the ship as per her sister ship HMS Trincomalee, currently preserved in Hartlepool, but other than fitting the ship with a bowsprit, these came to nothing.